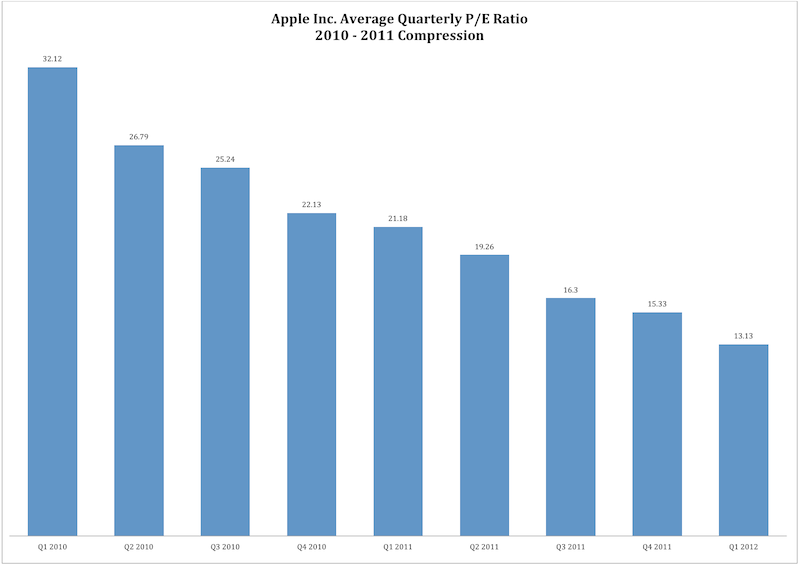 In light of the recent sell-off in global equities, it is now an incontestable FACT that Apple is the most undervalued and underappreciated large-cap growth company in America. The stock trades at an extremely depressed valuation that Wall Street isnt taking seriously (8.25 P/E Ratio), the companys growth continues to outpace every large cap company on the entire S&P 500, and the companys growth rate percentage  defying all laws of gravity  continues to accelerate without any sign of abating. Every quarter that goes by, Apple reports another multi-year record high growth rate that continues to be brushed aside and overlooked by investors. Apples stock performance relative to its valuation and fundamentals, and relative to other companies with lower growth rates and more expensive valuations is completely abysmal. 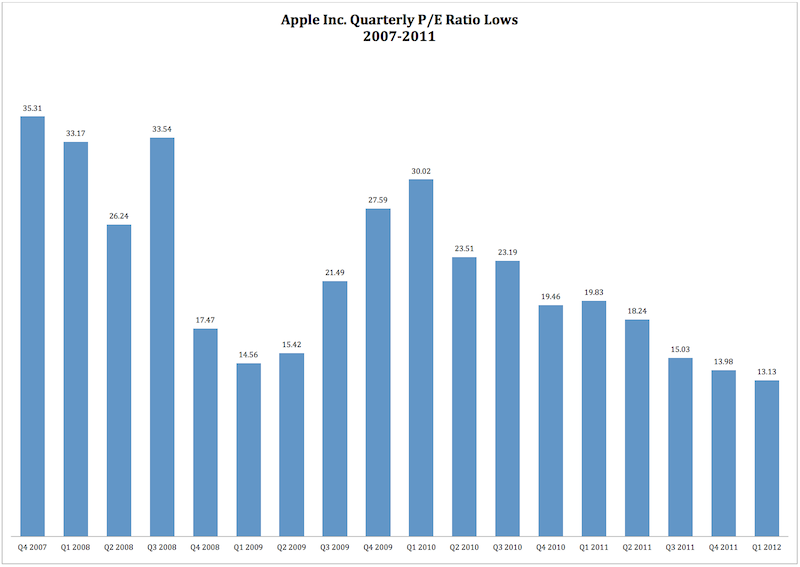 In its recently reported fiscal Q3 2011, for example, Apple reported a 6-year record-high growth rate of 121.94%. Yet, one would never know this by listening to CNBC, Bloomberg or reading the average article from The Street.com or Business Insider. Instead, the only stories you will see are ones that dont really matter in the grand scheme of things. For example, instead of pointing out how the company reported 122% earnings growth in fiscal Q3 or the fact that the company trades at a 13 P/E ratio, CNBC is quick to point out how iPod sales  an operating segment that makes up only 4% of Apples total revenue  is slowing. Nevermind the fact that iPhone sales grew over 140%  four times the smartphone market  from 8 million units to 20 million units in fiscal Q3 or the fact that Apples revenue has almost tripled in 2-years. Stop the presses because iPod sales which produces less in revenue than iTunes is now slowing. And it wouldnt be so bad if the press merely only reported these inconsequential facts. But its not just that. Its the highly misleading and faulty conclusions drawn from these inconsequential facts that have been so damaging for the stock over the years. If it isnt the Zune iPod killer, or the Android iPhone Killer, then its the Amazon Kindle Fire iPad Killer which amounts to nothing less than the obvious end of Apple. Forget about reporting the actual facts or the news, everything is now editorialized. No one cares to report that iPhone sales outpaced the market by 400% or how extraordinary it is for a company of Apples size to see accelerated revenue growth of 66% leading to sales of $108 billion in 2011. 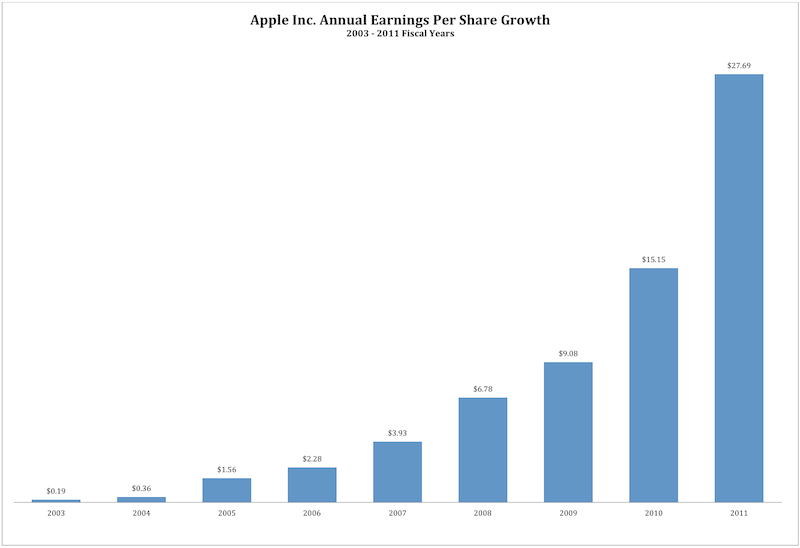 Or that you would have to go back to 2004 when Apple was reporting less than $1.00 in EPS to find a year with a higher EPS growth than the 82.71% Apple recorded in 2011. True story. See below. There seems to be an ever-present sentiment-war being waged against Apple as it is constantly hit from all sides in a very concerted way. And this is not something new. Its been going on for years with Apple. With the recent passing of Steve Jobs, it has only gotten much much worse. Im here to try and balance the scales a little by reminding everyone about the simple truth concerning Apple. While the companys earnings have absolutely skyrocketed since 2008, to the dismay of investors and to the delight of Business Insider, the stock has gone nowhere. 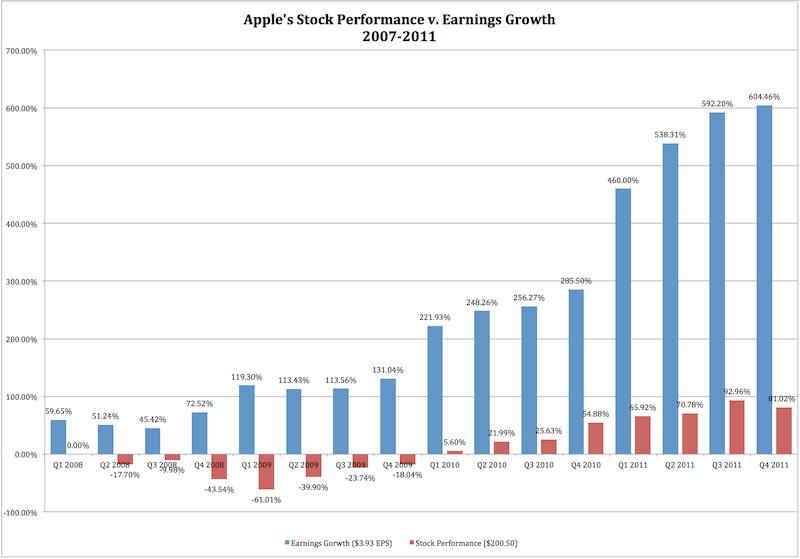 In late 2007, Apple traded at $200 a share after reporting $3.93 in EPS on $24.5 billion in revenue. Turn the pages to 2011 and its an entirely different company. 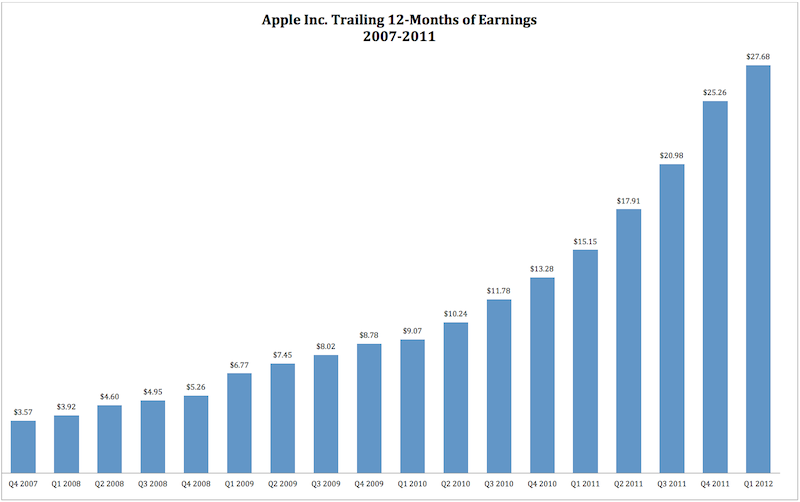 In just four years, Apples earnings have grown 600% to $27.68, and its revenue skyrocketed 341% to $108.2 billion. Thats the most explosive 4-year growth rate of any large-cap company on the entire S&P 500. The companys earnings growth accelerated dramatically in 2011 as it reported an 82.7% earnings growth rate. Yet, apparently an 82.7% earnings growth rate isnt good enough to give Apple a valuation that is higher than Ciscos (CSCO) 15.11 P/E ratio (earnings contracted in 2011), Oracles (ORCL) 16.35 P/E ratio (less than half of Apples earnings growth) or Googles 19.19 P/E ratio (grew 15% this year). Now if that doesnt shock you, then this will. 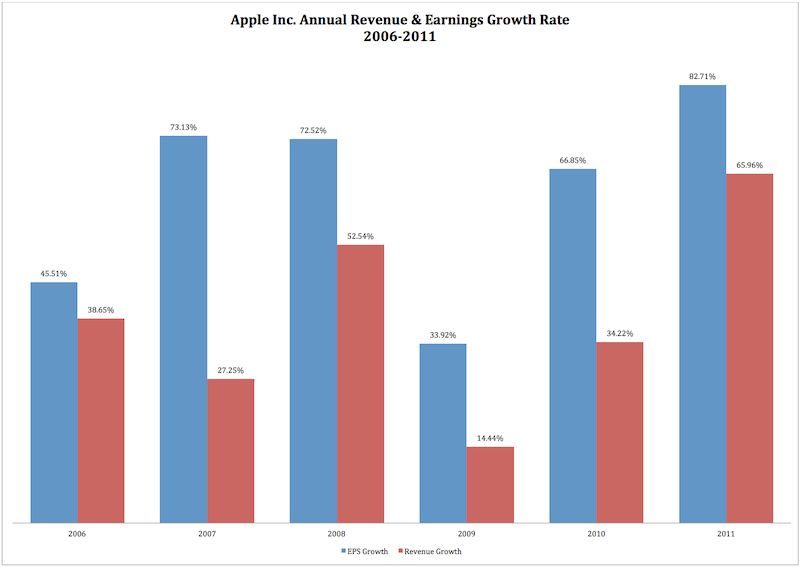 In fiscal Q2 2011, Apple reported a 6-year record high growth rate of 92.19% in earnings and 83.22% in revenue. That shatters the previous record of 86.03% earnings growth in fiscal Q2 2010 and 74.39% revenue growth in fiscal Q4 2008. After this report, Apple collapsed 14% over the next 3-month period on concerns that (insert any B.S. reason here). So after reporting the highest revenue and earnings growth rate in 6-years, Wall Street sells the stock down by $50.00 on the quarter leading to further massive P/E contraction. And if that isnt enough to convince you of how mistreated the stock is relative to its growth, in the very next quarter  fiscal Q3 2011  the company absolutely shatters fiscal Q2 2011′s growth rate in every way. The company recorded 121.94% earnings growth which is the highest quarterly growth rate since 2004. You would have to go back almost 8-years when the iPod was just getting started to find a quarter with a higher quarterly growth rate on earnings. Yet, despite this incredible year that Apple has reported, the stock is trading lower than it did 10-months ago and is now almost lower than it was a year ago. The company has accelerated and doubled its earnings, and is almost down on the year. It trades at under a .5 PEG ratio and less than 8x next years earnings. Apple is now trading at the S&P 500 average valuation of 13x despite growing its earnings at a pace that is higher than the top 100 S&P 500 stocks and higher than 90% of the stock listed on the index. By pricing Apple at $363, the market is saying that Apple is worth no more than the average stock. 66% revenue growth and 82% earnings growth isnt valued at all. Neither is Apples $100 billion cash (including fiscal Q1 2012) nor its entire balance sheet for that matter. In fact, Apple is now valued below the average stock trading on the NASDAQ-100 which suggests that the market believes that it is better to hold the NASDAQ-100 (QQQ) than it is to hold Apple from a valuation perspective. Now even though Apples growth has far and outpaced the growth of Oracle (16.35 P/E), Amazon (96.15 P/E), Google (19.19 P/E), Cisco (15.11), Qualcomm Inc. (20.62), Amgen, Inc (13.53), Comcast (15.11 P/E), IBM (13.95 P/E), Chevron (13.50), Johnson & Johnson (14.94 P/E), Procter & Gamble (15.49 P/E), and AT&T (13.91 P/E), the stock trades at a far lower valuation relative to these top holdings on the NASDAQ-100 and S&P 500. Some of these companies have actually contracted in 2011. Yet, the market values the earnings out of these companies on the order of 4-5 times more in some cases than they value the earnings out of Apple. The whole point of this article is to establish one thing and one thing only. That Apple is extremely undervalued contrary to what you might hear in the financial press. By demonstrating that the company is this undervalued, we will then be able to make a very compelling case for why this cannot go on forever. Eventually, Apple will hit an inflection point where this 2-year phase of P/E compression comes to an abrupt end. Apple is already valued below the S&P 500. If the earnings continue to come in anywhere close to 50% which is far below the 70-82% weve seen in the past 3-years, then the stock will have to rise significantly in order to merely maintain its depressed valuation. For example, in order for Apple to maintain its depressed 13.13 P/E ratio going into 2012 and 2013  which is right at the average on the S&P 500  the stock will have to rise to $577.72 next year. Most good analysts are expecting the company to report about $44.00 in earnings next year and about $55.00 in earnings in 2013. That would be 62% and 25% growth respectively. 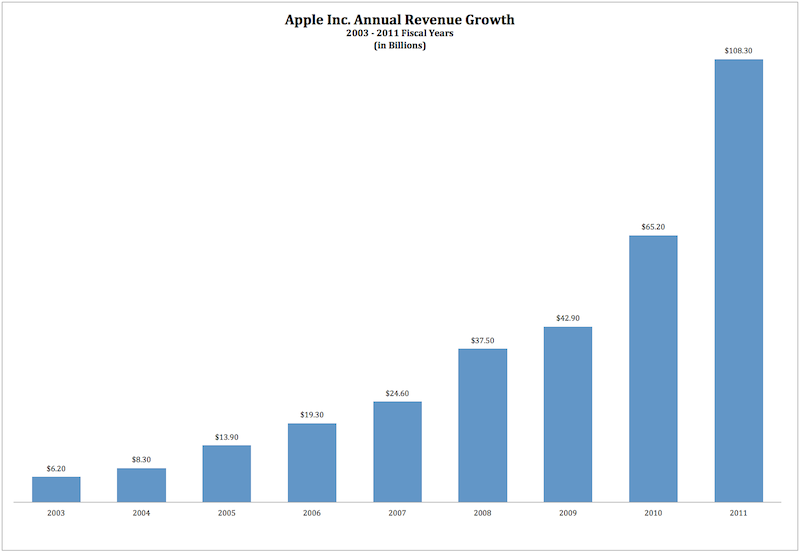 Thats far below the growth Apple has posted over the past four-five years (see above). Remember, Apples growth is currently accelerating and completely discounted. This outlook presupposes significant deceleration in the growth rate as the result of the law of large numbers. Yet, what you should take from this analysis is that Apple has nowhere to go but up. Suppose the stocks valuation were to contract further to a 10 P/E ratio within the next two years. Even if we get that level of P/E contraction which would be at a level that is far below the average on the S&P 500, the stock would still trade at $550 a share 2-years from now on the assumption of 25% growth between 2012 to 2013. What happens if the growth stays in the 60-70% range? What happens if the growth continues to accelerate? Neither of those scenarios are anywhere even close to being priced in. In fact, Wall Street is currently modeling for massive contraction in the growth rate. 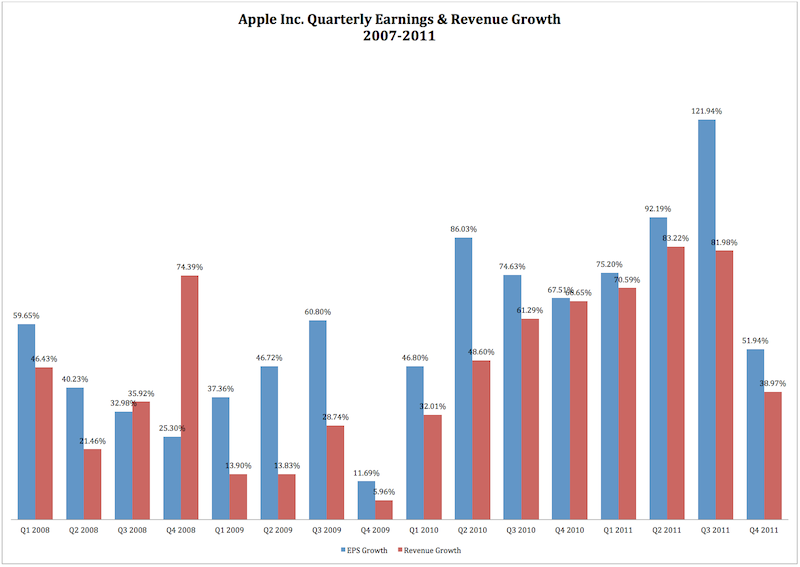 Thats an unwise decision given that Apple just guided fiscal Q1 2012  this quarter  for 80% earnings growth. Notice, Wall Street is modeling for 25% growth while Apple has guided for 80% growth. Who do you believe? In future articles, we will build a case for why Apple is reaching a floor in this age of P/E compression, and is about to undergo one of the biggest rallies in the companys history. As the valuation becomes more depressed, the case becomes even more compelling and the chances for a massive Apple upside correction increase dramatically. Stay tuned.